Situated a few minutes walk from Victoria tube station near an array of shops is a gem of a restaurant. 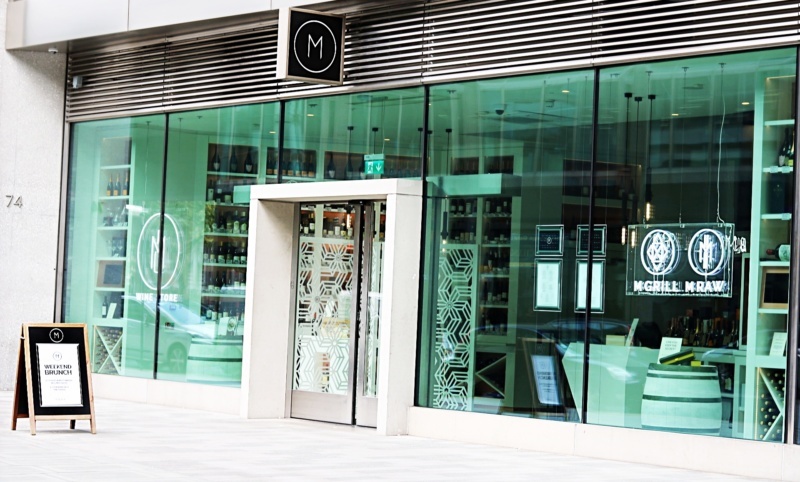 Modern, classy, sophisticated and fancy – those are the words that describe the M restaurant in Victoria. On entry we see two friendly faces behind the counter and are taken aback by the beautiful décor, we couldn’t help but admire the white background, which enhances the shelves that are stacked with bottles of wine. The music was upbeat and relaxed. The dimness of the room added to the intimacy of the restaurant, making this restaurant a perfect place for couples to visit. Whilst the music and well-structured menu ensures it is also well suited for social outings and even business meetings. A polite waitress, who was well mannered and professionally dressed led us to our table. The interior design is very modern, chic and state of the art! The colour green beamed on our faces, the restaurants colour of choice, with green carpet, green silk curtains, green lanterns hanging on the ceiling and comfortable green chairs, that we had the pleasure of sitting in all night. The layout of the dining area has been created to suit everyone. Along the sides, there are separate dining booths where you can enjoy some privacy and in the middle is an open dining space. The menus are well and beautifully presented. Our knowledgeable waited Mehmet informed us of the 4,000 wine bottles in the restaurant, with more than 100 choices and the steaks that are sourced from 6 different countries. I began with the Buttermilk-Fried Chicken, which was beautifully presented on a small platter. The fried chicken was crispy and well cooked, whilst the hot sauce provided a welcome kick. The Smoked Wagyu Tartare was given to us compliments of the chef (thank you, chef!). The presentation was excellent, the yolk sat perfectly on top, whilst the Foie Gras and horseradish married well. The Duck and Watermelon for me were an acquired taste. The duck was nicely cooked, it was juicy and filled with flavor, whilst the watermelon brought a tropical taste to the meal. However, the steak was incredible! It was tender, succulent and packed with flavour. This was my first time trying the Ribeye cut of a Steak, I usually go for a fillet, but now I am never looking back! The fluffy crunchy chips and the soft baby carrots were a great addition. The White Chocolate and Coconut Mousse was just divine! Not only was the coconut encapsulated in the mousse, but it boasted coconut strips sprinkled on to top. The lychee and yuzu added an additional sweetness. The M restaurant in Victoria Street was simply amazing. The service was excellent, the décor divine, the food out of this world and the music atmospheric. If you think this sounds to good to be true, visit the M restaurant in Victoria Street to find out yourself, you will be glad you did!